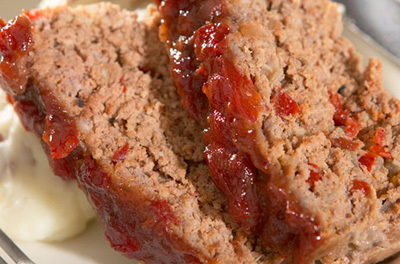 ﻿ Meat Loaf With Tomato Chutney - Merwanjee Poonjiajee & Sons Pvt. Ltd. Mix together beef , onion, 1/2 cup chutney, bread crumbs, eggs, parsley, salt, pepper. In a 9" glass pie pan, shape into a loaf. Combine tomato sauce with remaining 1/4 cup chutney. Pour over meat loaf, bake 1 1/2 hours, basting occasionally. Allow meat loaf to stand 10 minutes before serving hot . Meat loaf is also excellent cold. Merwanjee Poonjiajee & Sons Pvt. Ltd.
34, P.D'Mello Road, Prince's Dock, Mumbai - 400 009, India. chutney ©2014. All Rights Reserved.